Just wondering on the Therion since it has 2 18650's in parallel. 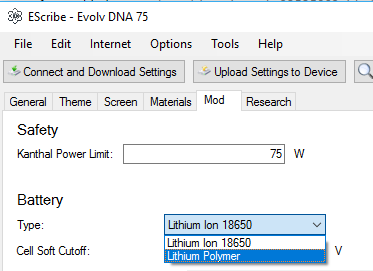 If you set it for Lipo, now here is my confusion, would you put Lipo 2cell 22.2 WH or would it be considered single cell 22.2 WH I haven't messed with mine since it seems to be working ok but if I did go into the manufacturers setting and set it for LiPo would it be considered 1 cell or 2. And when you change that are you supposed to put the total WH's or the SH's for 1 cell. Kind of confusing to me. That's right 2 cells in parallel just appear as one cell the board, same voltage. Got it also on my VT133 I changed it to read LiPo 2 cells and 22.2 WH is that correct or are you supposed to show the WH for 1 cell and it takes care of the rest. I figured it wanted the total WH for both cells or in the case of a 3 cell LiPo the total of all three cells not just for one but I could be wrong on this. So what's the answer.